The other day, my daughter and I were coming back from the city, and someone had parked in the middle of the road stopping buses getting past, so we decided to catch a train. As we waited, I took photos of the track and then used the after-touch on the camera to turn it black and white. I love the effect it gave. This entry was posted in Photography and tagged Camera, Life, Nikon, Nikon D3000, Photo of the Week, Photos, September. Bookmark the permalink. I am really beginning to like b&w images more and more…lovely! I am beginning to fall in love with black and white photos. Such a nice change from all the vivid colors. Love this track photo! Thanks Terry. As soon as I took it, I decided to do monochrome with it. Absolutely awesome image — and the B&W lends its an otherworldly and old-world charm that I would suggest gives it slightly more “meaning.” To be sure, the color version is lovely, but there is something so evocative about B&W photography that color can never equal, imho. Nice leading lines in this shot. What sort of person parks in the middle of the road! 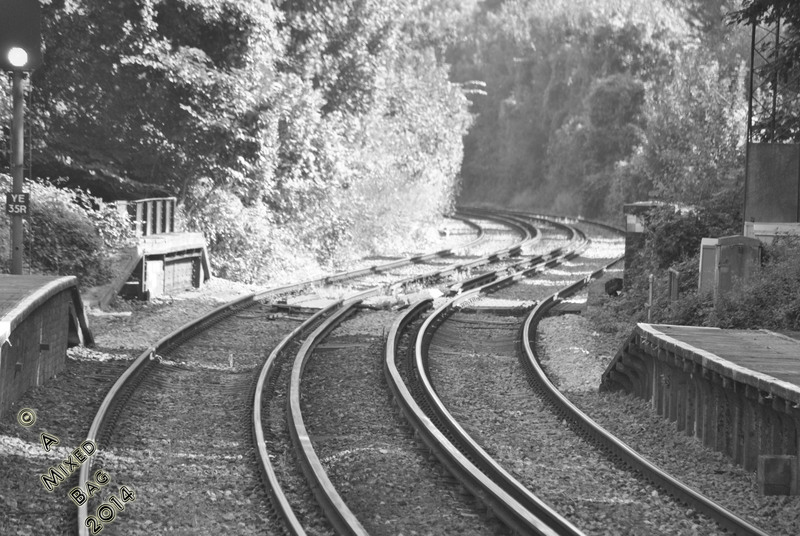 I love railways, especially old photos and I would have assumed that this was one of those, it’s amazing what cameras can do. There are many stories to be had from a photo such as this. Magical is how I see it. I particularly like the sun, that makes it, it is the quintessential type of photograph. I think this might be my all time favorite of yours. It’s quite fantastic. There’s a timelessness to it. Amazing isn’t it? Black and white gives definition to all the edges and this shot has a full pan if tones. Excellent. I am amazed at it. I beat you to that one Courtney, it’s already there haha. Well, not this precise photo, but one I took there. That is a classic and timeless shot. Oohh, I love that picture! Right, I had to look twice when I read that you’d just taken it, and that it was current! I think I should post the original as well.